Conventional wisdom and legally required safety labels have trained us to understand that we shouldn’t look directly at laser lights, lest we become blinded by their eye-searing output. That’s still almost universally true, except when it comes to BMW’s laser-powered headlight concept. These lasers were designed to prevent blindness—specifically when it comes to oncoming drivers and high-beam headlights. BMW’s M4 Concept Iconic debuted in Las Vegas at the Consumer Electronics Show, a venue traditionally known for smartphones and 3D TVs, but where automotive tech has played an increasingly major role. And these laser-based headlights certainly dazzled everyone—figuratively, at least. It’s perhaps more accurate to call these headlights “laser-powered,” since the light they put out is significantly different from the pencil-eraser-sized dot you’re familiar with. In fact, deep within the headlight’s guts, the light from a monochromatic blue laser is converted into output that won’t burn your retinas to a crisp. “A special optical system directs the rays from the high-performance diodes onto a phosphor plate inside the light, which converts the beam into a very bright white light that is similar to natural daylight and pleasant to the eye,” BMW explains. The whole process creates light that’s ten times more intense than today’s xenon, halogen, or LED headlights—all while consuming 30 percent less energy. And BMW has some nifty tricks to keep that laser-derived light from blinding oncoming drivers. 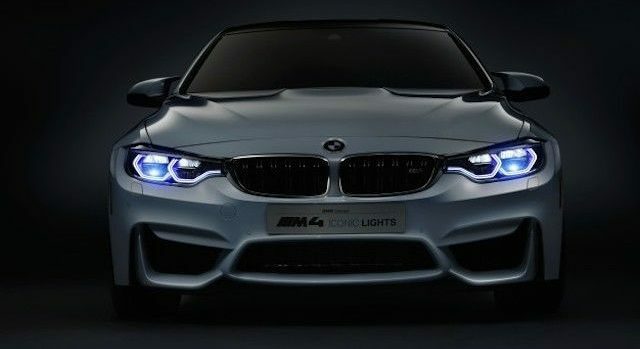 The Concept Iconic’s headlights cast light nearly 2000 feet ahead of the vehicle, more than twice the distance of conventional high-beam headlights, BMW claims. A camera-based Selective Beam system detects vehicles ahead of the car—either in the oncoming lane or those traveling in the same direction as the laser-lighted Bimmer—dimming the portion of the beam shining on the other vehicle. No more blinded drivers, and no more angry gesticulations from the traffic around you. That’s not the only laser trick: BMW says the active headlights can use the car’s GPS coordinates to intelligently light the curves ahead, even before the driver turns the wheel. And a sci-fi sounding “Spotlight” feature uses an infrared camera to detect humans or animals more than 300 feet away, illuminating them to prevent, for example, surprise encounters with skittish roadside deer. The system can even project width markers ahead of the car, showing you if you’ll actually be able to squeeze through that narrow alleyway without leaving behind paint samples, while “high power diodes” can use the road surface as a sort of head-up display, showing driver information in the cast of the headlights. When can we expect all this laser-powered amazingness? Well, never, if you’re a U.S. car buyer. While BMW has sold some laser-headlighted BMW i8s in Germany, here in the United States such technology is banned by outdated federal vehicle-lighting standards. So write your member of Congress and let ’em know: We want some frickin’ lasers!